Nogizaka's 20th single with Shiraishi Mai as the center. A simple, yet beautiful, music video with touching lyrics. Hope you all enjoy it! 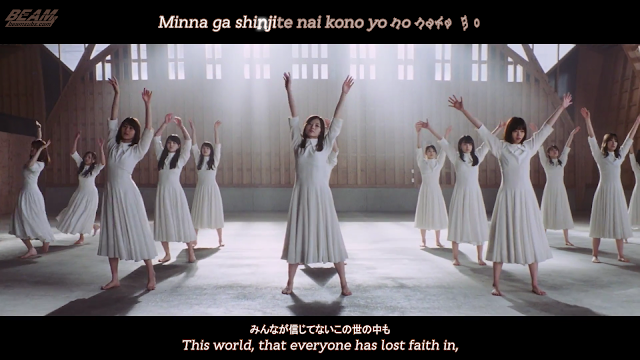 El 20th single de Nogizaka46 con Shiraishi Mai como centro. Un video musical simple pero hermoso con letras conmovedoras. Esperamos que les guste! We don't release softsubs for MVs or short duration videos. Just because the file sizes are small and it's usually just easier for everyone to download the hardsub. Thanks for subbing this... beautiful lyrics indeed. I been curious for a while if you chose a new oshimen since himetan already graduated. I've been asked that a few times now lol. My oshimen has always been Wakatsuki Yumi, and still is. And now waka-sama is graduating._.